Volcano View Hedgehogs (VVH) is a small, USDA licensed breeder of African Pygmy Hedgehogs located in Port Orchard, Washington. We serve Kitsap County, the greater Seattle area, and western Washington. Our top priority is breeding for health, temperament, and conformation, and our breeding animals are chosen from among the best lines from breeders in the US and Canada. All babies are handled 2-3 times daily, starting from as early as the mother will allow (usually around 7 days old). They are well socialized and given individual attention to prepare them for their new homes. Babies come with a health guarantee, lifetime warranty against WHS, starter bag of food, birth certificate, weight chart, care booklet, and post-sale support for the entirety of the hedgehog's life. We are actively involved in online hedgehog communities and are a member of the Hedgehog Welfare Society (HWS). We are also involved in local rehome and rescue efforts - we will take in any hedgehog in need of a home. We are proud to have the most genetically and colorfully diverse hedgehog herd in the northwest! It comprises a multitude of carefully chosen bloodlines from many different breeders. 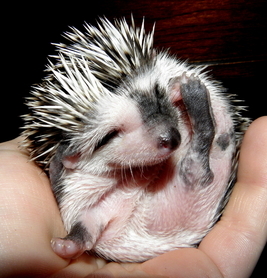 We currently work closely with ﻿Storybook Hedgehogs﻿, an excellent breeder in Utah, and Bloomin Hedgehogs, a recently retired breeder with over 10 years experience. We feel that collaboration and ongoing discussion with breeders that share our ethics and goals helps us to continuously improve our methods and the hedgehogs that we produce. We also have a large variety of colors and patterns in our herd, including a handful of new and unusual colors not yet officially recognized. The majority of the babies that we have available are dark range pintos, snowflakes, or solids. We also regularly produce browns, cinnicots, and apricots, as well as occasional albinos and some new colors. We're happy to point new owners toward the best resources for research, as well as answer any questions you may have as you prepare for your new hedgehog. For anyone interested, we also allow visits (by appointment only, with a reservation form on file) so you can see our hedgehog room, meet and handle some of our hedgehogs, and have your questions answered. Please feel free to contact us with any questions, or to schedule a visit! We look forward to hearing from you. 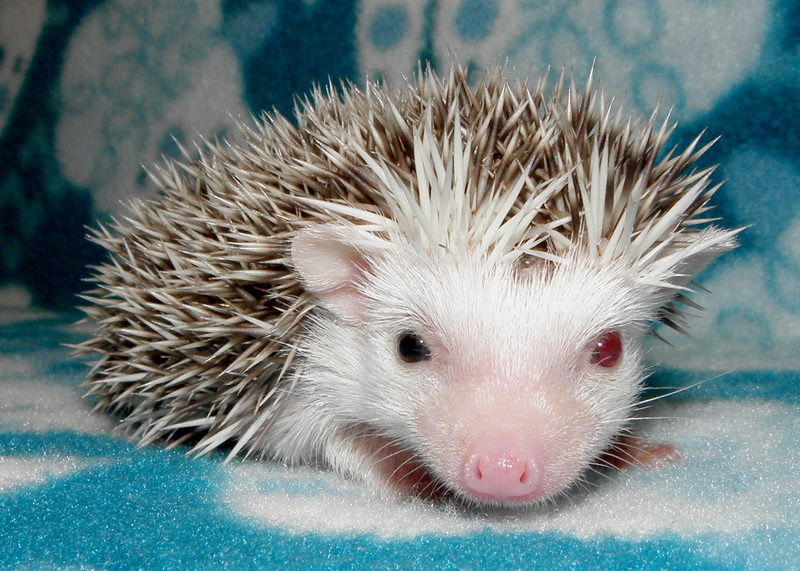 If you are interested in a hedgehog from us, PLEASE fill out the reservation form FIRST. We do our best to respond to all emails, but inquiries received without a reservation form on file will be given least priority. We have some adults available! First-come, first-served, with an approved reservation form and deposit. 1. 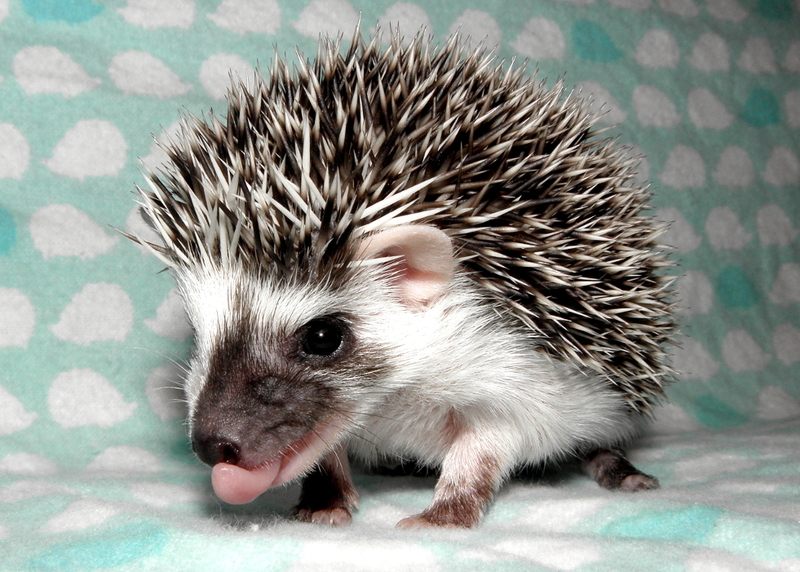 If you have not owned a hedgehog before, please read the hedgehog care page. 2. Read the policies page. You must agree to these terms to purchase a hedgehog from us. 3. Fill out the reservation form. 4. After we have reviewed your reservation form, you will receive an in-depth email that goes over our deposit and selection process, current availability, recommended sources for doing research, and any suggestions or additional information based on the answers you give. 5. You must place an advance deposit to be added to the priority list. We rarely have babies available to the public - most of them are reserved by people on the priority list. To place the deposit online, use the Paypal button on the available babies page. 6. When new babies are available and posted on the website, the priority list is contacted in order to make their selection. 8. After you choose a baby, you can place an order for any supplies. If you are not purchasing supplies from us, your enclosure must be approved before scheduling a pick up appointment. 7. Babies are ready to go home at 6-7 weeks of age. When you pick up your baby, we will spend approx. 60 minutes (more if necessary) to help you learn to handle your new pet and answer any questions you may have. 8. Babies must be paid for in full before we will allow them to leave our home. Check out our supplies page for details! We also have an online shop!